Part of the Scalene group of lateral neck muscles,this muscle is absent in a large percentage of the population. Cadaver studies report finding it on one side in between 7% and 46% of the population. AKA Albinus Muscle, Sibson Muscle. ↑ Am Surg. 2013 Apr;79(4):372-4. 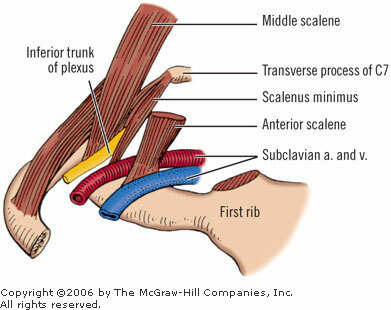 Scalenus minimus muscle: overestimated or not? An anatomical study. Natsis K, Totlis T, Didagelos M, Tsakotos G, Vlassis K, Skandalakis P.